If you’ve never brewed today’s coffee before, or you are using a new brewer, you need to add that coffee and/or brewer once. Pressing the square icon for an item selects it, so you can delete it by pressing -. This DELETES the item forever. Use the ratings bar to give your cup a rating. The cup information is saved when you LIFT your finger off the ratings bar. 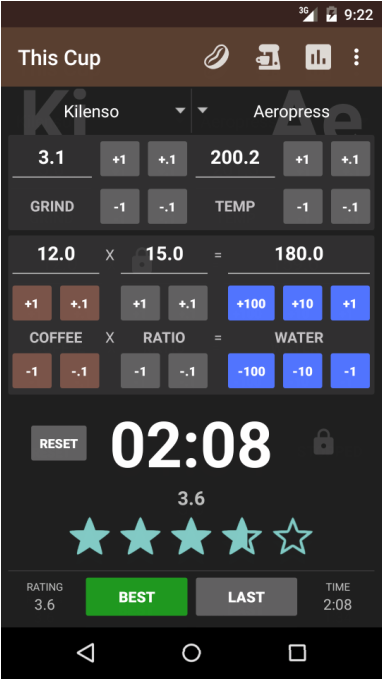 As long as you've not yet rated the cup, you can still modify all parameters, including the bean/brewer combo. BEST button gives you the parameters for the best cup you've had for this coffee/brewer combo. LAST button gives you the parameters for the last cup you've had for this coffee/brewer combo. MENU, DELETE CUP will delete the current loaded cup. This only works after clicking BEST or LAST. When you adjust COFFEE, it gets a lock icon, meaning it is locked. If you then adjust WATER, RATIO is the one that will change. If you change RATIO, it becomes locked and COFFEE will change when you modify WATER. To quickly lock either RATIO or COFFEE, I suggest doing a quick +1 -1 on the one you wish to lock, then modify WATER. When you RATE, press BEST or LAST, the clock will become locked. If you press the clock, it will not resume. It will instead assume you are starting a NEW brew and start from 0. The previous steep time and rating values will stay at the left and right of the BEST/LAST buttons while you brew to give you a helpful reminder of the previous values. When you start the clock, it will speak the time every 30 seconds. This is so you get a reminder while you are distracted by a squirrel or something shiny. This way you don’t have to setup a timer, but you still get reminders. A setting to turn this on or off is coming in a future update. You don't need to use GRIND, TEMP, or even RATE. You can just use the ratio calculator and the talking stopwatch. NOBODY* is forcing you to rate cups. The GRAPH button (in the actionbar) will show you your BEST 30 cups for this coffee/brewer combo, from worst to best (X axis). Cups rated the same are next to each other, so, if your best 30 cups were all rated 2.5, the X axis becomes meaningless. You can scroll down to get to the fourth graph!